With the launch of Rise of the Tomb Raider on PC this week Dark Horse Comics will be following later this month with a new comic release for the series. Set after the events of Rise of the Tomb Raider, the latest Tomb Raider comic series sets Lara Croft on another adventure around the world. Described by Dark Horse as a perfect starting point for readers new to the series the narrative doesn't require to have played the games to understand everything. However, from my experience reading the first issue I couldn't see the complete appeal of it for those that aren't familiar with the video game series. The comic's premise follows Lara exploring the mysteries behind a rare mushroom that is said to unlock the secrets to defeating death. That quest for immortality leads not only Lara to search for the mushroom, but an enemy force that will battle her to secure the plant first. The first issue doesn't offer much insight on well much of anything to be honest. Everything presented was vague hints of what's to come which serves as a good teaser but doesn't quite work at delivering a compelling narrative. It was entertaining to see Lara visiting an archeology conference at the University of Minnesota. But again this part of the comic won't make much sense to someone who isn't familiar with the character of Tomb Raider. Hopefully more about Lara will be revealed in later issues for those new to the character. However, fans of the video game series will easily get involved with the narrative as it follows the typical Lara formula of discovering some mystery that only she can solve with her unique set of tomb raiding skills. At 32 pages I can't judge the narrative too much as I'm guessing we're in for a lot more to happen in later issues. It's a good start, if slow at some points, to another Lara adventure that I'm eager to see the final outcome. It's perfect timing too as I plan to begin playing the PC version of Rise of the Tomb Raider this weekend. Dark Horse has published other Tomb Raider comics in the past so this isn't the first time that they're exploring the character and I'm confident it's in the right hands. 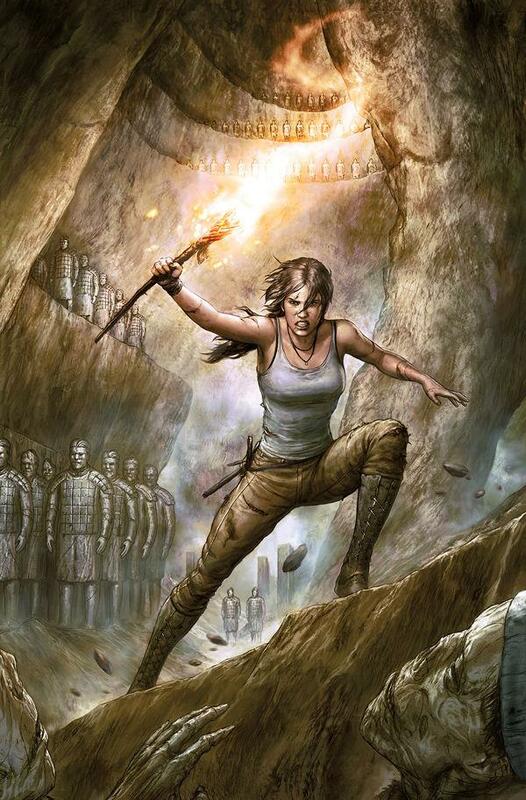 Tomb Raider #1 is a recommended read to fans of the video game series and eager for more of Lara's adventures. Those that are new to the character should also enjoy the comic, but might have to wait for later issues for more to be revealed about Lara and her back story. The first issue will be available on February 17 from Dark Horse Comics and retail for $3.99.